Vivo and Oppo are out to take smartphone market in India by storm. The companies have earmarked an aggregate market budget of Rs 2,200 crore. The target is Korean brand Samsung, the Indian smartphone market leader. The BBK Electronics-owned Chinese handset brands Vivo and Oppo are relying heaving on sports to penetrate into their targeted market – the Indian youth. The sister concerns have grabbed the best two spots in cricket. Oppo is the Team India title sponsor and Vivo the IPL brand. The second largest title sponsorship deal outside cricket too is inked by Vivo – a whopping Rs 300 crore for Pro Kabaddi League title – @Rs 60 crore per annum for five years. “Vivo with sports has been able to penetrate into its targeted segment, which is youth, in India,” says Vivek Zhang, Chief Marketing Officer, Vivo India. Next on the cards is hockey. Vivo will soon announce the presenting partner tie-up with the Hockey India League. HIL title is not available at least for 2017. Public sector Coal India Limited had acquired those rights for three years (2015-2017)@ Rs 18 crore per annum. 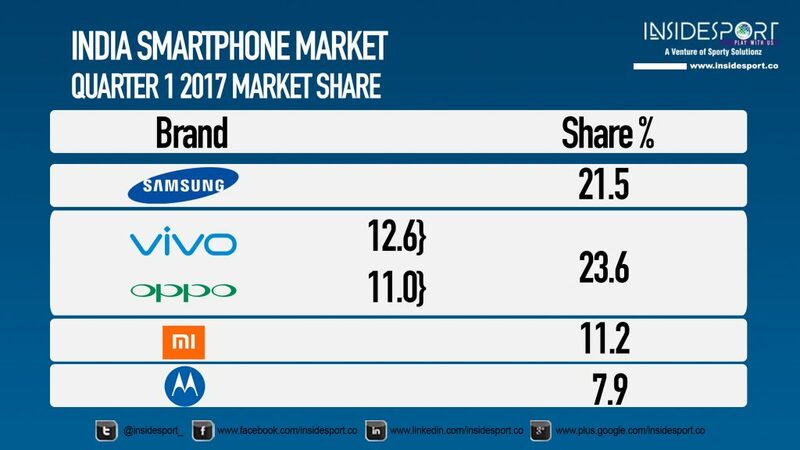 Collectively Vivo and Oppo are not far behind Samsung in Indian smartphone market sales. The Q1 2017 data reveals that BBK Electronics needs just a minor push to lead the Indian mobile handset market leader in India with Vivo-Oppo combined market share. Companies’ on-air advertising strategy to revolves around sport. E-commerce categories which till two years ago dominated advertisement and sponsorship slots are virtually out of sight now. The TAM Media Research data reveals, the Mobile Handsets and Telecom Services category together accounted for 32% of the total advertisements during the live telecast of the first 15 matches. 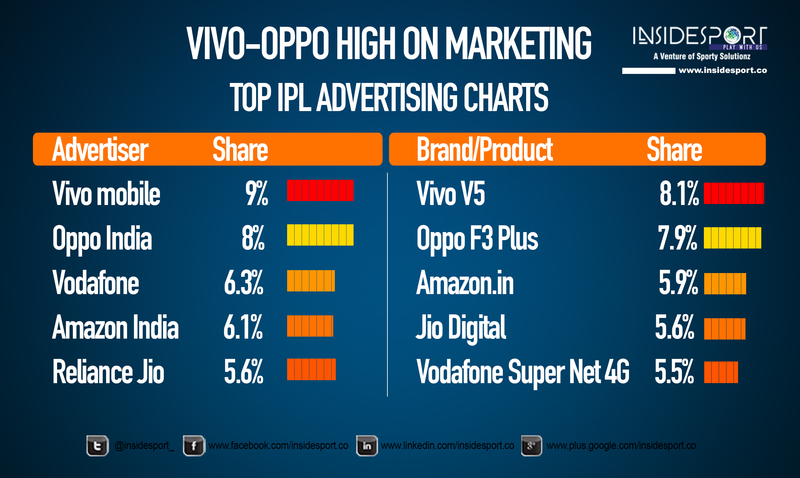 Vivo and Oppo account for 50% of these numbers – market leaders with 16% visibility across all slots. Among the Top 5 brands who have the largest ad share this IPL 10, Vivo Mobile India, the title sponsor and co-presenting sponsor, was the top advertiser with a 9% share of the total ad volume, closely followed by sister company Oppo India with 8% share. 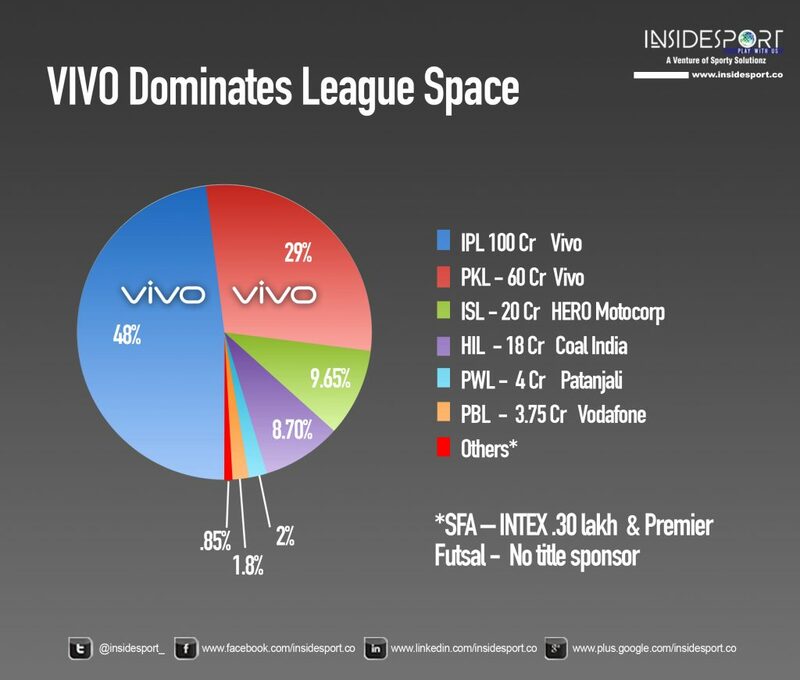 Vivo is also ruling the league title sponsorship space, contributing to 77% of the gross league title sponsorship values in the country. This comes from the two most expensive and most watched properties across all sports leagues in India. 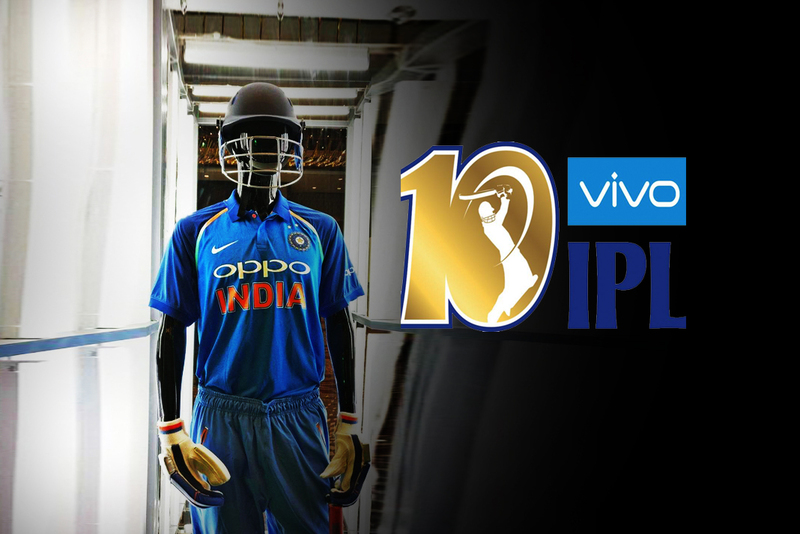 The Chinese handset brand had acquired the IPL title sponsorship rights, vacated by Pepsi three years after its five-year deal, at Rs 100 crore per annum for the two years. On Monday, Vivo announced second biggest title deal for an Indian sports league – Rs 300 crore to acquire the Pro Kabaddi League title for five years. “Sports is the ultimate marketing and advertising for mobile phone category. The Chinese majors are using it to their advantage. This will continue. Revenue returns on IPL have been big. Kabaddi is the next best option available,” says brand and business strategist Harish Bijoor. Positively a welcome scenario for sports. With Gionee also smartly investing on sports properties from its Rs 700 crore marketing, Indian sports sphere shall remain a good competitive field for Chinese Yuan.